Hollywood is a district of Los Angeles, well known as the center of the entertainment industry. 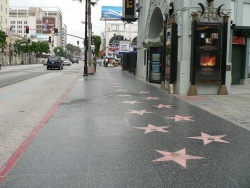 The Hollywood Walk of Fame is located along Hollywood Blvd. The main Metrolink and Amtrak stop in Downtown LA is Union Station. Take Metro Rail Red Line between Union Station and Hollywood. This page was last edited on 19 August 2018, at 13:11.